There's an overwhelming amount of information that comes from the connected world. Information sources are endless, but their credibility can be questionable. Cyber security teams can often relate with an overload of threat data from a variety of sources. Building an effective threat intelligence capability requires drilling down through all of information to find the data that is most relevant to you. So where do you start? 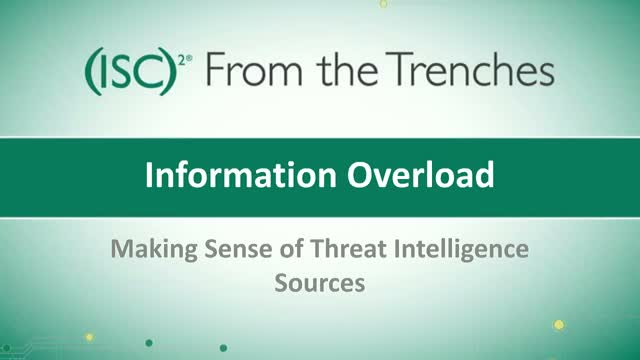 To avoid information overload, an organization needs to be selective about the sources that they need to stay ahead of the threats and exploits that can compromise them. Join (ISC)2 and our sponsor Recorded Future for a From the Trenches webcast on March 2, 2017 at 1:00 PM ET for a discussion on threat intelligence sources, what's available out there, and how to separate the signal from the noise so you can spend less time on data collection and more time on analysis.